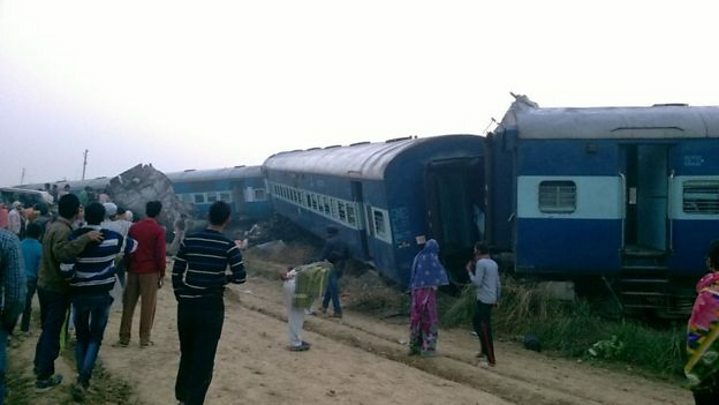 The death toll following the derailment of a train in India's northern Uttar Pradesh state has reached at least 115, with more than 150 injured, police say. However, the Times of India quoted sources as saying a fracture in the track could have been to blame. Krishna Keshav, who was travelling on the train, told the BBC: "We woke with a jolt at around 3am. Several coaches were derailed, everybody was in shock. I saw several bodies and injured people." By late Sunday afternoon, rescue workers were still using heavy machinery to try to reach survivors. Senior railway official Pratap Rai told Reuters: "We are using every tactic to save lives but it's very difficult to cut the metal carriages." The BBC's Sanjoy Majumder, in Delhi, says rescuers brought out two children alive on Sunday morning, raising cheers from onlookers. Passenger Ruby Gupta, 20, was travelling to Azamagarh to be married on 1 December. She told the Times of India that most of the people travelling with her had been found but that her father was still missing. She said: "I cannot find my father and I have been looking everywhere for him. I have a fractured arm and my sisters have also sustained injuries." Many anxious relatives gathered at the station in Indore, where the train began its journey, holding pictures of loved ones, the Times said. Indian Prime Minister Narendra Modi tweeted: "Anguished beyond words on the loss of lives due to the derailing of the Patna-Indore express. My thoughts are with the bereaved families. "Prayers with those injured in the tragic train accident." Mr Modi said he had spoken to Railways Minister Suresh Prabhu, who was "personally monitoring the situation closely". On his own Twitter account, Mr Prabhu warned that "strictest possible action will be taken against those who could be responsible for accident". He said an investigation into the crash would begin immediately and compensation would be paid to "unfortunate passengers who died and to injured". Home Minister Rajnath Singh said that India's National Disaster Response Force was overseeing the rescue efforts. Train accidents are fairly common in India, where much of the railway equipment is out of date. An accident in Uttar Pradesh in March last year killed 39 people and injured 150. Last year, the government announced investments of $137bn (£111bn) over five years to modernise and expand the railways. An end of national railways?